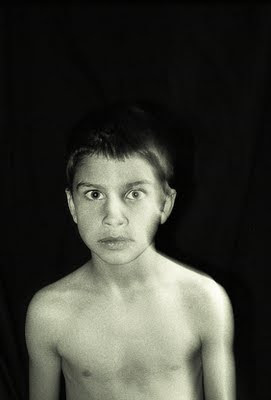 Cole Denton photographed by his father Don Denton, circa 2001. About eight years ago, the photographer Don Denton asked his sons to race through the family’s basement rec room. The boys made faces as they darted in and out of their father’s frame. The youngest son lost interest after just a few minutes of tomfoolery. The series of images captured on film with his trusty Nikon startled the photographer, who was, for obvious reasons, quite familiar with the models and their repertoire of expressions. Cole, the youngest, stands bare-chested, his almond-shaped eyes opened wide, pupils fully dilated. The stare gives an alien, almost amphibian, countenance to his face. Some see him as frightened. Others think he’s shocked. Perhaps he sees something the rest of us miss. “It’s the eyes you’re drawn to. They’re wide and they really draw you in,” Mr. Denton said. In time, he placed more than 100 photographs with the agency. He got not a nibble. Mr. Denton, 52, has spent his working life as a photojournalist, a vocation he traces to working on the high school annual in Maple Ridge. He learned to make prints in the basement darkroom built by his classmate, Nick Didlick. In the late 1970s, he found work in Vancouver pulling timber off the green chain at a sawmill. He also published photographs from the fledgling punk-music scene, a rare documentarian for early gigs by the likes of the Furies, Rabid, Subhumans, the all-girl Dishrags, and the Skulls, the precursor to D.O.A. He sold some of his concert photos to the Georgia Straight for $10. The newspaper jobs eventually came and Mr. Denton worked as a lensman for the Kamloops News and the Kamloops Daily Sentinel, the Vancouver Sun and the Edmonton Sun, the Calgary Herald and the Reuter news agency. Along the way, he decided to take it as his goal to make Canadian writers better known. He prepared two books of photographic portraits of authors, some so well known they need no first name (Atwood, Coupland), others still obscure enough to defy recognition (Cheryl Foggo, Hiromi Goto) outside their readership. These volumes, published by Banff Centre Press, are titled “First Chapter” (2001) and “Second Chapter” (2004), which means he will not spend much time thinking up a title for any sequels. These days, Mr. Denton, who is photographic supervisor for the Victoria-area newspapers of Black Press, is recuperating from operations on his right eye to repair a retinal tear, a particularly distressing injury for a photographer. The worst moments came as he rode the ferry to the Mainland, unable to fly in his condition, for emergency treatment. He has had two recent bits of good news. He will be going to the Olympics for his employer. His eight-year-old photo of his son was purchased by Oxford University Press. The image graces the cover of the latest novel by Julie Hearn, a popular author among teen readers in Britain. Set at the beginnings of the Second World War, “Rowan the Strange” has been longlisted for the Guardian children’s fiction prize. 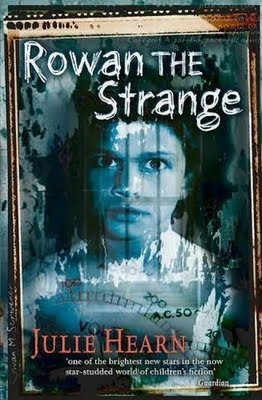 Rowan is a schizophrenic boy who is sent away to a hospital for experimental treatments to cure him of the voices in the head that have encouraged him to violence. On the dust jacket, a playacting Cole Denton represents a disturbed Rowan. Cole, 16, worked construction this summer, cleaning up sites after the journeymen completed their jobs. He is entering Grade 12 at Edward Milne Community School in Sooke. He plays basketball, listens to rap and hip-hop, likes to write snippets of fiction. He does not remember the details of the day his father had him pose. He has shown the dust jacket to his friends. Their reaction? His father anticipated a modest windfall for the good fortune of having his son’s image selected. By the time the agency took its cut, a half share, Mr. Denton made $154.75. He described the sum as munificent. Want to save your workplace? Buy it.